Special guests will include: Ann Blair, Mary Lee Kennedy, Ethan Zuckerman, and more! We used to know how to know. Get some experts, maybe a methodology, add some criteria and credentials, publish the results, and you get knowledge we can all rely on. But as knowledge is absorbed by our new digital medium, it's becoming clear that the fundamentals of knowledge are not properties of knowledge but of its old paper medium. Indeed, the basic strategies of knowledge that emerged in the West addressed a basic problem: skulls don't scale. But the Net does. Now networked knowledge is taking on the properties of its new medium: never being settled, including disagreement within itself, and becoming not a set of stopping points but a web of temptations. Networked knowledge, for all its strengths, has its own set of problems. But, in knowledge's new nature there is perhaps a hint about why the Net has such surprising transformative power. David Weinberger writes about the effect of technology on ideas. He is the author of Small Pieces Loosely Joined and Everything Is Miscellaneous, and is the co-author of The Cluetrain Manifesto. 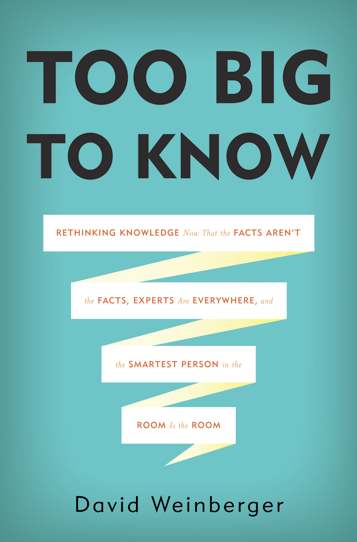 His current book, Too Big to Know, is about the Internet's effect on how and what we know. Dr. Weinberger is a senior researcher at the Berkman Center. He is also co-director of the Harvard Law School Library Lab, and is a Franklin Fellow at the United States Department of State. He has a doctorate in philosophy.